This Hawaiian macaroni salad is one of our favorite dinner side dishes of all time. It is cool and creamy, the perfect side for BBQ and Asian food. Next to the Oregon State University campus is a little Hawaiian restaurant called Local Boyz. The food they do is wonderful. Beef ribs with crunchy edges in a sweet and savory sauce, juicy pulled chicken and flavorful steak strips all served up with big scoops of white rice and Hawaiian Macaroni Salad. It’s a tiny place, always bursting with students and locals. We often have to get our food to go because we can’t find a table. My memories there are mostly with my husband. It’s the restaurant where Jonathan taught me to use chop sticks long before we started dating. Now we live 500 miles away from Local Boyz, as do many people I know who have great college memories of it. We have tried other Hawaiian type grills but nobody has food as good. The mac salad is never anything like what Local Boyz served. Since I can’t drive 500 miles for lunch I simply had to figure out how to make it. Jonathan and I worked together over many, many, many batches to find the perfect balance of milk, mayonnaise, garlic and pepper. The final result is astounding! We make a lot of Korean BBQ around here and this is the perfect side dish. I also take it to cookouts on a regular basis and somebody is always asking for the recipe. If you are planning on attending a 4th of July BBQ today this is the perfect dish to bring along no matter what is on the grill. I hope you enjoy it as much as we do! Have a very safe and happy 4th!!! This is one of my more popular posts. 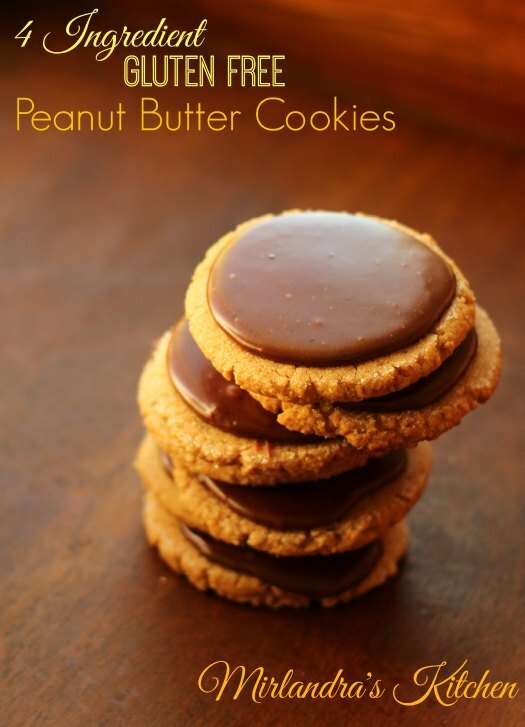 You might also enjoy my popular post for 4 Ingredient Peanut Butter Cookies with Chocolate Frosting. Bring a large pot of salted water to a rapid boil. Add macaroni and cook until tender, 10-13 minutes. Meanwhile, in a medium bowl, combine all the other ingredients. When pasta is tender, run it under cold water until cool. Drain it well, tossing a few times to get all the water out of the elbows. Add pasta to the mayonnaise mixture and toss until pasta is thoroughly coated. Cover the bowl with plastic wrap and refrigerate for a minimum of 3 hours. The pasta will have absorbed some of the mayonnaise and will look strange. Stir and it will look creamy again. Taste for salt and adjust if desired. This salad ge's stronger every day it sits. The garlic and onion flavors can develop a lot! I like to eat it the first and second days but after a week it is no longer "nice." This post is participating in the Weekend Potluck! 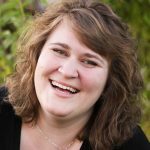 I am a corvallis, oregon visitor and i am just very happy to find this page! I love local boys and whenever i am in corvallis, i go there for lunch ir dinner. It is truly amazing. Thank you for postibg this! I an going to try this today!! Ps. Together with the shoyu chicken!! I’m so glad you love the restaurant the way we do! We have a recipe for “Da Sauce” too. Just check the Recipe Index. Enjoy! I just made this today, and I have to say it is as close to Local Boyz of all the mac salad recipes I’ve tried to make. Thanks for your many trial and errors. This salad was fantastic. Thank you! It is a real family favorite these days. I am so glad you enjoy it also! I just moved to Corvallis a few months ago! I will definitely try out the place! And thanks for the recipes! Welcome to my home town! It really is a beautiful place to live. If you are on the hunt for great food I would also recommend the French Bakery, Le Patisserie on Circle Blvd. The make a pretty amazing pastry. We find they sell out early but whenever we visit Corvallis we make a special trip for the cream cheese filled pastries. For Chinese King Tin on 9th street is amazing and our favorite tacos / burritos are found at La Roca also on 9th st. Happy eating! Thank you! I have tried King Tin, and did not like it. I still haven’t found a chinese place I like here yet..But I lived in Ohio all my life, so I knew where to find the good ones! I love french pastery, so will def try out the bakery. I hope you find something you love there! I’m kinda a cooking novice, but before you combine the mixture with the pasta what should the consistency be of the mixture? Runny? Thick? I’m so glad you are experimenting in the kitchen! That is how I learned to cook. Sometimes the stuff I made was a disaster but over time I had fewer disasters and more awesome meals! Before you combine the sauce and pasta it will be very runny. The pasta will soak up some of the sauce and the final results will be magic. Enjoy! So excited to find this! We moved in August to Pennsylvania from the West Coast and we miss Hawaiian the most and Mexican second. While we’ve been able to find some “eh” Mexican places (though most people have never heard of tostadas or the movie Nacho Libre!!!) there isn’t a single Hawaiian place to be found. 🙁 My husband is an OS alum and we bleed black and orange. We had to give up our season football tickets with the move (more tears) and EVERY football game we would go to King Tin, absolutely our favorite Chinese food. We would always say, “You know it is authentic by the clientele and when they bring out whole fish with the heads still on to them.” 😉 Before we moved we had a softball game in Portland and we took a “detour” to Corvallis for one last King Tin trip before heading back to western Washington. We also ate Hawaiian one last time in Portland. Hi, do you use whole milk? I use whatever I have in the kitchen. Generally 2%. I think this salad is not too picky and you could probably get away with any fat level except maybe skim? I have not tried it with skim so no promises. 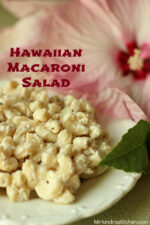 We just got back from a trip to Maui where Hawaiian mac salad was the first thing my kids wanted to eat. They were very disappointed in the three mac salads they had during the week because they didn’t live up to this recipe. We just arrived home and this mac salad is already chilling in the fridge for dinner! Thanks for a great recipe! Oh thank you! This made my day 🙂 I guess when we head over to HI we might have to skip the salad! So that would mean for 1 16oz bag of noodles I am using approximately 5 cups of mayo and 1.5 cups of milk? Either way, wouldnt this be approximately 3cups of sauce/mixture to 2.75 cups of uncooked noodles? Oh goodness! That sounds really complicated. (Or maybe I just need another cup of coffee!) If you want to make more salad I would suggest doubling the recipe and not trying to figure out the numbers by the size of the bag of pasta that you have. If you do recipes like this a lot and it works well for you great but otherwise I’m not sure that will turn out.